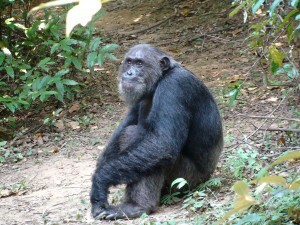 Several of my blog posts have featured Frodo, the iconic alpha male chimpanzee of Gombe National Park. Frodo also figures prominently in several of my research papers, given that he has been a major player in aggression at Gombe, both within his own community, and during attacks on the neighbors. I’m sorry to report that Frodo died on Sunday, 10 November 2013. Perhaps fittingly, given Frodo’s aggressive behavior in life, aggression seems to have contributed to his death. Necropsy revealed that he had a scarred scrotum and infected testis, probably due to what seems to have been a canine puncture wound received in August 2013. As ye sow, so shall ye reap. Jane Goodall named Frodo for the noble, humble, diminutive hobbit from the Lord of the Rings, which she had been reading to her son. From a cute little baby chimpanzee, Frodo grew to be a hulking brute, a despotic alpha male, and a fearless hunter of monkeys. Frodo was born on 30 June 1976, the second of Fifi’s nine offspring. 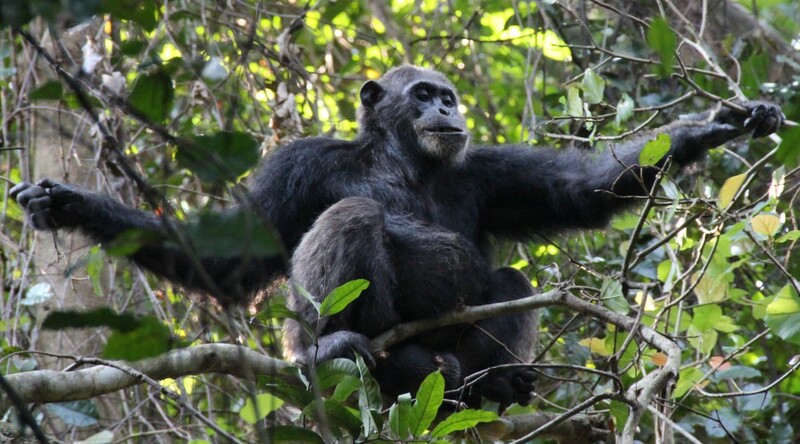 Fifi was a highly successful mother and was for many years the highest-ranking female of Gombe’s Kasekela community. As an infant, Frodo proved mischievous, disrupting Jane Goodall’s efforts to record data on mother-infant relationships by grabbing at her notebooks and binoculars. As he grew older, Frodo developed a habit of throwing rocks, charging at, hitting, and knocking over human researchers and tourists. In 1988, Frodo grabbed and pulled at cartoonist Gary Larson’s arm when he visited Gombe, and the next year Frodo severely beat Goodall herself. In his prime, Frodo weighed 55 kg (121 lbs), larger and stronger than any of his peers. Frodo rose quickly in the ranks as he matured and won the position of alpha male by overthrowing his brother Freud in October, 1997. Frodo reigned as alpha male for 5 years, until weakened by sickness in December 2002. We knew the game was up for Frodo when he gave submissive pant-grunts to the next alpha male, Sheldon, in January 2003. As alpha male, Frodo ruled by brute force. Unlike his brother Freud, who frequently groomed lower ranking males in apparent efforts to win their support, Frodo rarely groomed any other males, but instead frequently presented himself to be groomed by them. Frodo competed vigorously for mating opportunities throughout his life, fathering his first offspring, Zeus, when he was 17, and his last, Samwise, when he was 25. He even forced his attention on his own mother, fathering an infant, Fred, who lived for less than a year before dying in a mange epidemic. Frodo fathered both of Gremlin’s twins, Golden and Glitta, the only wild chimpanzee twins known to have survived to adulthood. Frodo’s son Titan follows in his father’s footsteps by throwing rocks at baboons, chimpanzees and people, and has recently challenged the current alpha male. In total, Frodo fathered eight offspring, more than any other male at Gombe but Wilkie (who fathered 10). Frodo’s offspring were born to six different females: Trezia, Patti, Gremlin, his own mother Fifi, Sparrow and her daughter Sandi. After being deposed in 2003, Frodo spent months by himself recovering, and when he rejoined the other males he had fallen to low rank. He continued to show keen interest in competing for mates and hunting monkeys, but he mellowed considerably, and in his last years rarely showed any signs of aggression towards people. Frodo was the first chimpanzee that I saw in Gombe, and I recognized him instantly, with his silvery grey back, the round ruff of silvery hair framing his face, and his large size. Frodo taught me what life is like for most chimpanzees: you must constantly be aware of where the alpha male is, because he might charge any time, and may beat you up. The first time he came charging past me, I wondered why everyone was running away; as a kid I had read George Schaller’s descriptions of gorillas, and how when they charged you must stand your ground, and only people who ran got bitten. I assumed the same must be true for chimps. And sure enough, when I studied chimpanzees for my dissertation research in Kibale Forest, Uganda, the alpha male Imoso would simply veer around me if I got in his way, acting as if that was what he meant to do. But not Frodo. He saw that I wasn’t moving and went straight at me, knocking me into the bushes. He beat on me briefly with his fists, but in a surprisingly gentle way. He could have easily done real damange, but he acted as if his only goal was to show me who was boss. Him. My next day in the forest, I was extremely wary of Frodo. I managed to avoid him for most of the morning. However, during a hunt, someone else ended up with the carcass of a redtail monkey, and Frodo was angry. He charged around, displaying. He charged past a whole line of researchers to get to me, where he knocked me into the bushes yet again. That was the last time that Frodo bothered me, though. He seemed to accept that I was part of the gang of people that followed him and his community all around the forest, and that I sufficiently acknowledged his magnificence. Frodo resting on the trail in June, 2009. Frodo was one of several F-family chimpanzees that rose to high status. Most of Fifi’s offspring that survived to maturity rose to high ranks, with three of them becoming alpha male: Frodo’s older brother Freud, Frodo himself, and the current alpha male, Ferdinand. 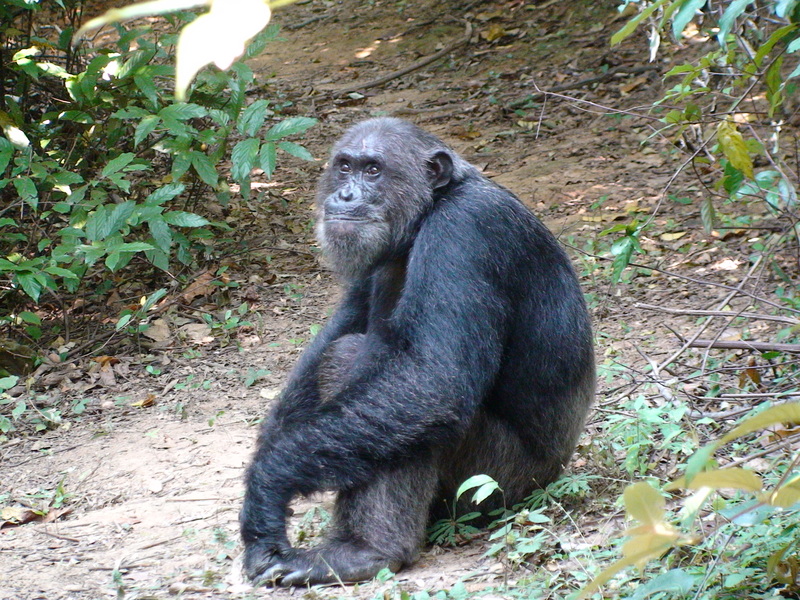 Fifi’s daughter Flossi is one of the highest ranking females in the Mitumba community. Frodo is survived by four sons (Zeus, Titan, Tarzan, and Sindbad), three daughters (Golden, Glitta, and Samwise), his brothers Freud, Faustino, and Ferdinand, sisters Fanni, Flossi, Flirt at least two grandchildren, and numerous nephews and nieces. Frodo grooming his daughter Glitter (June 2012). Researchers and filmmakers followed Frodo throughout his life, making him one of the most thoroughly documented wild chimpanzees in history. Numerous books and scientific articles described Frodo’s success as a hunter, fighter, and alpha male. Frodo first appeared in films as an infant in People of the Forest: The Chimps of Gombe (1991, Discovery Channel). Frodo knocks presenter Charlotte Uhlenbroeck off her feet in The New Chimpanzees (1995, National Geographic). The films Fifi’s Boys (1996, BBC) and Chimpanzee Diary (1997, BBC) depict Frodo’s rising power and rivalry with Freud. Frodo dominated the giant screen feature Jane Goodall’s Wild Chimpanzees (2002, Imax), filmed at the peak of his powers. More recently, Frodo was featured in The Dark Side of Chimpanzees (2004, BBC), Return to Gombe (2004, Discovery Channel) and Chimpanzee Family Fortunes (BBC, 2006). Gombe just won’t feel the same with Frodo gone. In 1985 I visited Gombe. Frodo chose me to rub my leg, which I’ve cherished the pictures of. Later I realized I was lucky it was only rubbing my leg that he did. Great that you got a chance to meet Frodo in person! You might want to mention that, in addition to tugging on Gary Larson’s arm, Frodo once killed a 13 month old child. Yes, that tragic event is something I debated including in this post, and perhaps should have done so.